Or for a personalized copy of this paperback at $20 (shipping and handling included), email Michael@dunmovinranch.com and we will get your order processed. This is a combined work containing Dr. Mike’s Horsemanship Ground Steps to Success, Dr. Mike’s Horsemanship Responsive Riding, Dr. Mike’s Horsemanship Riding Exercises, Dr. Mike’s Horsemanship Horse Owner’s Modern Keys for Success. Together this collection takes horse and rider from ground work to build a strong foundation to riding with softness and focus. Dr. Mike’s Horsemanship Ground Steps to Success Horsemanship lessons that teaches you the basic foundations of ground work that will help you build a stronger relationship with your horse. Inside you will find improved ways of working with your horse so that you can succeed in every equestrian discipline. This book covers the essentials of ground work that can be translated into the saddle. This electronic book includes: 1) Preparation for Ground work and Riding 2) Understanding your Horse’s body language 3) Pre-signal and preparatory commands, and 4) Ground Steps to Success (walk, whoa, disengage hips, back, go forward cue and other movements). Dr. Mike’s Horsemanship Responsive Riding In this book Dr. Mike provides numerous training exercises so that riders will gain a better feel of the horse. Each exercise is well described and shares with you the benefit of performing the exercise. The book includes multiple warm-up exercises for getting better directional control and the proper use of your legs when riding. Advanced exercises are included for enhanced responsiveness. The basics of dressage and proper biomechanics are presented to help you improve your body language and pre-signal communications with your horse. Dr. Mike’s Horsemanship Riding Exercises This book includes 12 easy to follow riding exercises complete with written instructions and diagrams. Great for warm-ups and giving you and your horse some new challenges. These exercises incorporate Classical and Western Dressage Elements. 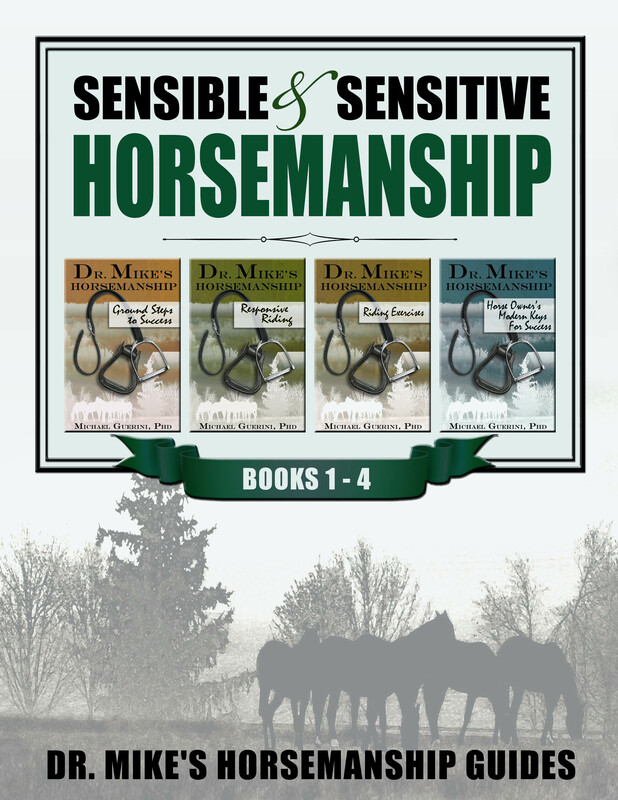 Dr. Mike’s Horsemanship Horse Owner’s Modern Keys for Success. A collection of Essays from many years of successful horsemanship. This book focuses on ideas to help new horse owners build a strong foundation of thoughts and ideas for success in owning, riding, and training horses.